Feel the breeze and experience the spring meadow through this signature smell. PureAire Essences contain essential oils. Made from botanical extracts and contain vital oxide disinfectant which has antibacterial and anti fungal properties. They are non-toxic, non-flammable, alcohol free, biodegradable and environmentally safe. 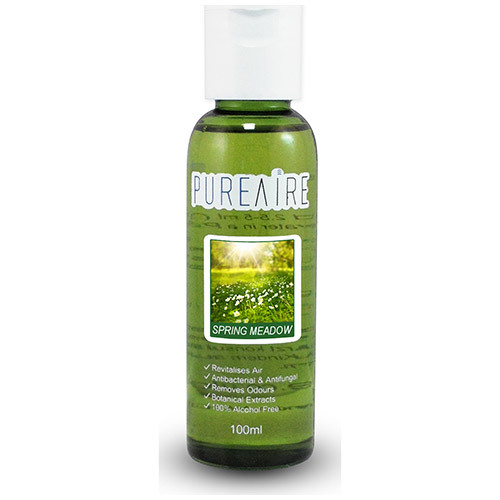 Below are reviews of PureAire Air Purifier Essence Spring Meadow - 100ml by bodykind customers. If you have tried this product we'd love to hear what you think so please leave a review. Feel the breeze and experience the spring meadow through this signature smell. PureAire Essences contain essential oils. Made from botanical extracts and contain vital oxide disinfectant which has antibacterial and anti fungal properties.